OK, you've found out where we are, and when the worship times are. Maybe you want to check St. Matthias' out and see if you will like it here. But first, you've got some questions. That's good! If you are coming to St. Matthias' for the first time, we are delighted that you are here. Everybody you see here was a newcomer at one time, and we've all had questions – maybe the same ones. So don't hesitate to ask a question, or check out these answers below. If you need help, ask anyone here, and we will be happy to assist you. We want you to be comfortable so you can enjoy your visit, and we hope you will come back. So… make yourself comfortable. When you are worshiping God, you can’t get it wrong, and regardless of what anybody else is doing, don’t feel you have to do anything that makes you feel uncomfortable during the service. There is a parking lot behind the church on the east side, and a small lot on the south side. All lots are visible from the church. You may also park in spaces on Chicago Avenue or in the large Minocqua municipal parking lot north of the church that borders Chicago Avenue and Highway 51 N. This layout of the church will help you find everything. Wear what you feel comfortable in. You will see people wearing everything from blue jeans to a suit. No dress code here. Children of all ages are welcome at all services. By virtue of their Baptism, children are part of the Body of Christ and welcome at St. Matthias. Quiet activity bags containing coloring books, toys and crayons are available by the doors to the nave, (our main worship space). During the school year (September-May), a nursery is available during the 10:00 AM service. Ask an usher to let our trained, Safe Church Volunteers know you'd like to have them sit with your children. They will show you where the room is so that you know where your children are at all times. The children will return to the church to be with you just before communion is served. Please note that if our trained volunteers are out of town, this service will be unavailable. Yes, our facility is accessible. If you have any special needs, talk to the priest or other member of the congregation, and we will try to accommodate you. All are welcome here. If you would like to contribute to the mission and ministry of the church, we certainly won't stop you! Here's how it works: An offering is taken in the middle of the service. The ushers pass plates along the rows. At Evensong, we don't take any collection, but there is often a basket set out at supper afterwards if you feel like contributing to the cost of the food. There is a basket set out at coffee hour, too. What should I expect at a service and afterward? For full information please see our page that talks about this. Briefly, you can expect prayers that are said in unison by the congregation (they are found in the bulletin or the Book of Common Prayer), a reading from the Old and New Testament, a sermon with that helps us connect our lives to the scriptures, beautiful hymns, and welcoming people. Afterward, we invite you to join us in sharing refreshments and friendly conversation at the coffee hour. Why is everyone so quiet in the church before the service? We take time before the service to reflect, to pray or perhaps go over the readings or other information printed on the inserts in the bulletin. The bulletin is the program that you receive from the ushers before the service. It is basically an outline for the service. The bulletin also includes announcements about upcoming activities, birthdays, and anniversaries. Is it necessary to kneel during certain prayers, and to stand during hymns? 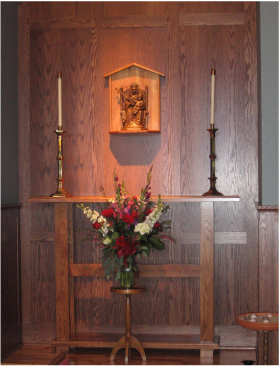 Episcopalians are comfortable with a wide variety of physical expressions of devotion and adoration during worship. You may see people bowing, making the sign of the cross, kneeling or standing. You are free to participate in ways that you are comfortable. If you are not comfortable or able to kneel at the times indicated in the bulletin, please stand. If you are not able to stand, please remain seated. Why do some people touch themselves on the forehead and shoulders? This is called making the sign of the cross. Christians have been doing this since the earliest home churches. For an informative and entertaining five minute explanation of the practice through the centuries you can watch, "Father Matthew Presents: The Sign of the Cross." Father Matthew is assisted by his friend Tyrannosaurus Regina. This looks very much like a Roman Catholic Church. Is it? No. The Episcopal Church, like the Lutheran Church, evolved from the Roman Catholic Church. The service is similar, but there are differences in certain practices and beliefs. Is it okay to take communion if I am not a member of the church? How does the communion process work? Also called "Eucharist," Holy Communion in the Episcopal church, is served every Sunday. All worshipers at St. Matthias' are invited and encouraged to participate in communion. Communion is received at the altar rail. Just follow your row up to the altar. You may kneel or stand to receive communion. Just put your right hand, palm up, in your left hand and the priest or a deacon will put a piece of bread in your hand, saying, "The Body of Christ, the bread of heaven." After responding, "amen" to signify your acceptance, simply raise your hands to your mouth and eat the bread. Next comes the wine. We use real wine, not grape juice, and a shared cup or "chalice." When the chalice bearer comes to you, you can help guide the cup to your lips. As the chalice bearer gives you the wine, he or she will say, "the Blood of Christ, the cup of salvation." If you do not want the wine, simply fold your arms over your chest as the chalice bearer approaches you.